When You Can Reach Everyone...You Make Sales! No one else can make you a unique offer like this. One login, one HUGE mailer, one click and you are done. It doesn't get any easier. 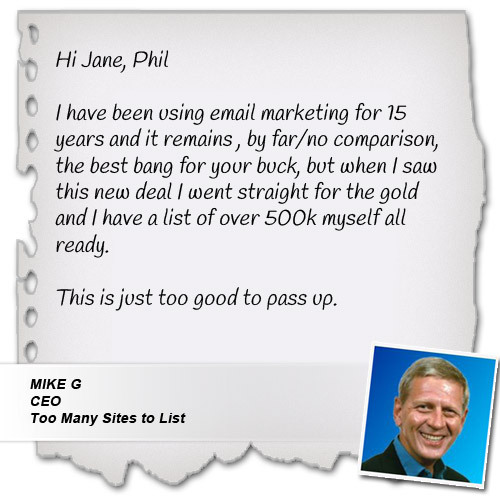 Put your email marketing on steroids. 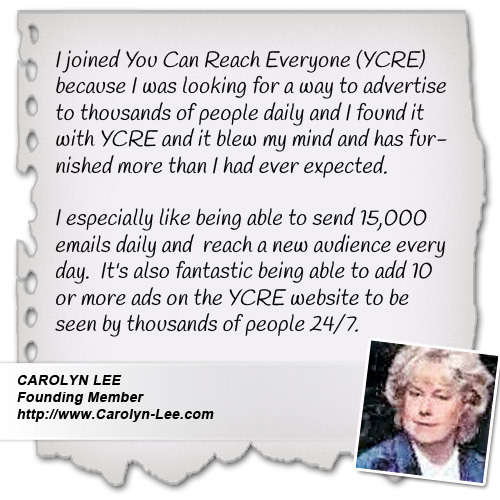 If you are serious about your marketing you simply must add You Can Reach Everyone to your arsenal. You can make sales daily. Display your ads to a highly engaged audience all day, every day, simply by clicking a button. We call it the login, click, leave, marketing method and it's as easy as 1,2,3. You can save time and money. 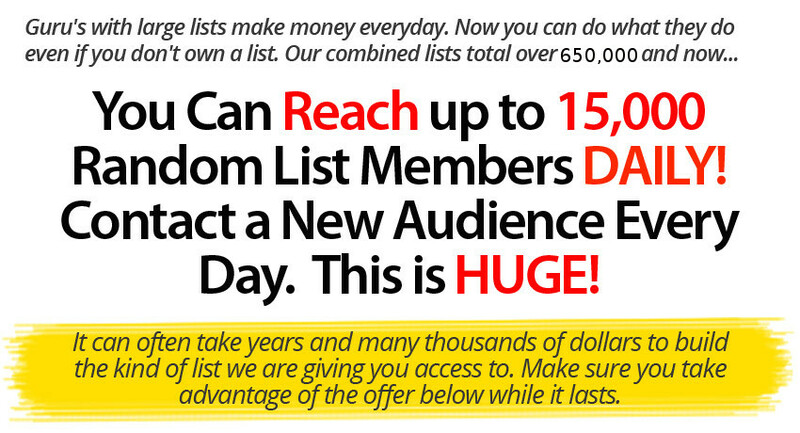 Not only can you save time by mailing to many lists with one mouse click, you will also save a lot of money by not having to spend money on advertising to build you own list. You can choose your comfort level. You can choose what level you join at. You can choose to reach 3,000 every 5 days. 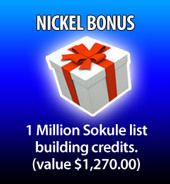 7,500 every 3 days, or 15,000 each day. You join at the level that meets your comfort zone. You can spend your ad dollars wisely. If you do any kind of paid advertising, or paid media, you know that you pay money for a campaign, and when it ends you need to pay more money to keep the campaigns running. This can get expensive. With You Can Reach Everyone, you can pay one time and that's it. You can use our unique Twister income builder. Some people call this a downline builder. Some call it an income funnel. We call it the Twister income builder.. Depending on the level you join at you can add 1, 2, or 3 programs you personally own and generate signups and sales for your programs. You can earn swift commissions. There are 4 earning levels. Copper level (free) users earn 20% commission. Bronze level users earn 25% commission. 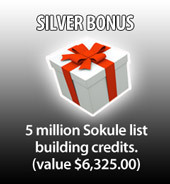 Silver level users earn 30% commission. Gold level users earn 40% commission. You get FREE ads in our unique AdHops System. All members get free ads in our AdHops System. The higher your member level the more ads you get and the faster your ads hop to the top. The AdHops System appears on high traffic pages in the member area and on this page below and give your ads mass exposure. Each AdHops Ad you view causes your ad to climb 1, 2, 3, or 5 spaces at a time until it reaches the top. You also get 1 FREE Paid Feature Ad. 20% on membership, feature ad, and AdHops sales. Add your affiliate IDs free. Get 2 free ads with a 4 ad hop ratio. View 60 ads get 1 extra free ad. Reach 3,000 members every 5 days. Add 1 site you own free. Get 4 free ads with a 8 ads hop ratio. View 40 ads get 1 extra free ad. 25% on membership, feature ad, and AdHops sales. Reach 7,500 members every 3 days. Add 2 sites you own free. Get 6 free ads with a 12 ads hop ratio. View 25 ads get 1 extra free ad. 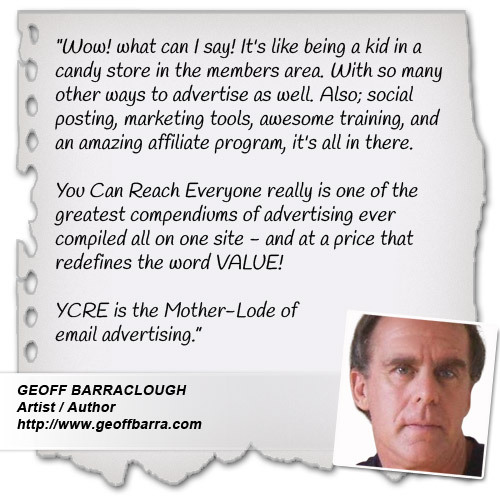 30% on membership, feature ad, and AdHops sales. Reach 15,000 members each day. Add 3 sites you own free. Get 10 free ads with a 20 ads hop ratio. View 10 ads get 1 extra free ad. Get 1 free Feature with 100,000 ad views. 40% on membership, feature ad, and AdHops sales.